The Nightowls took Texas by storm in 2014 with the release of their debut album, Good As Gold. The Austin Chronicle hailed them as “suave, energetic, blue-eyed soul” and named their album one of the Top 10 of the year at its annual music awards. Austin Monthly named them a Band to Watch. They have spent the last four years bringing their ecstatic live show to stages around the country, including the Austin City Limits Festival. 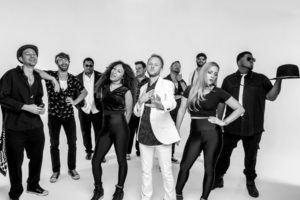 Their sound is an energetic blend of classic soul and modern pop with influences running the gamut from James Brown to Michael Jackson. Bright, bold horns dance and leap over a funky rhythm section, and the group’s voices shimmer and shine with gorgeous harmonies. Their sophomore recording earned them serious national attention from The Atlantic and Southern Living to Relix and Pollstar. The 10-piece band’s newest recording is We Are the Nightowls.